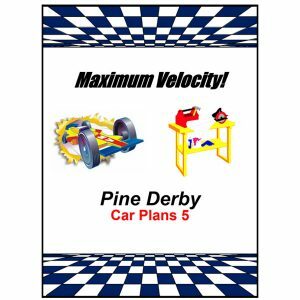 Pinewood Derby Car Plans 3 provides you with three winning car designs: the Wedge Turbo, the Wing, and the Formula One. All plans include templates and step-by-step instructions, and the plans provide for optimal quantity of weight, optimal weight placement for both the standard (scouting) wheel base and the extended wheel base, and much more. The three plans in the Car Plans 3 booklet are relatively simple to build, thus, they are ideal for those who have had limited experience with woodworking and with pinewood derby racing. 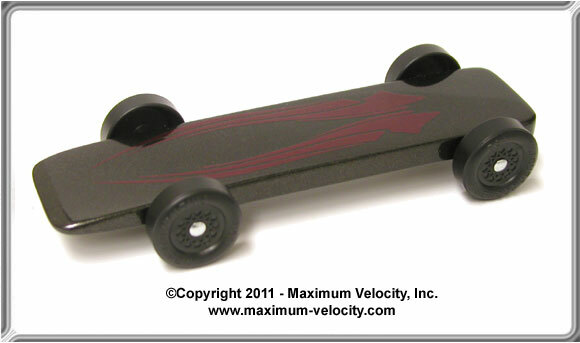 (2)The Formula One is only available in standard wheelbase. THE WEDGE TURBO adds a racy twist to the classic wedge design. With ease of building and top performance, THE WEDGE TURBO is a great choice for new builders. The extended wheel base can be created by either cutting new axle slots with two hacksaw blades, or by drilling axle holes with the Pro-Body Tool. Instructions and templates are provided in the Car Plans 3 booklet. 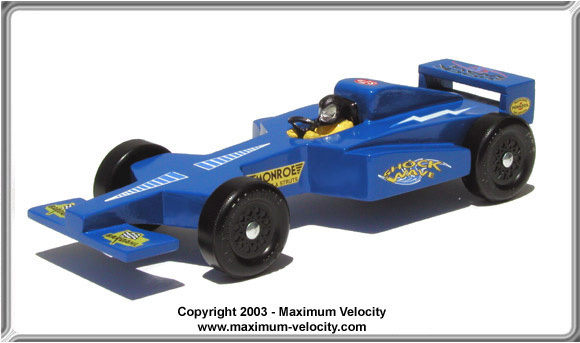 Modeled after the EJ11 Jordan race car, THE FORMULA ONE will not only tear up the track but will also catch the eye of the spectators and judges. Optional: 1/8 inch thick Basswood measuring 6 inches long (minimum) x 1/2 inch wide (minimum) (hobby store item) - The car can be completely built from the pine block, however, the use of the basswood simplifies creating the wings. 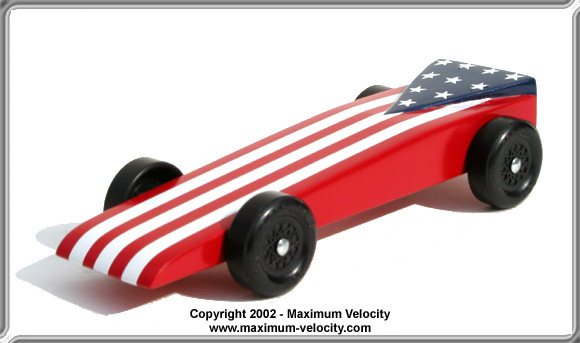 Stock Car, Stripes and Flames, and Custom Designs decal sheets was used to customize the car in the photo. The driver is a hobby shop item. THE WING is the ultimate in aerodynamics. 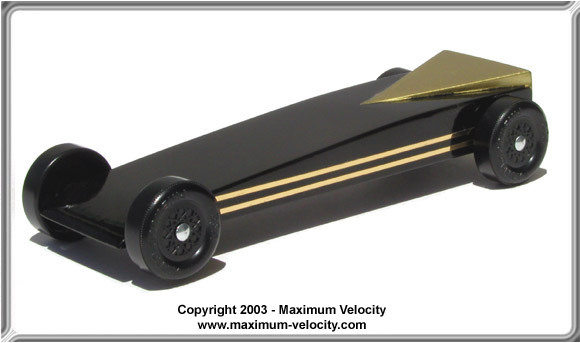 At just 3/8 inches thick, THE WING easily slips down the track, producing top results. 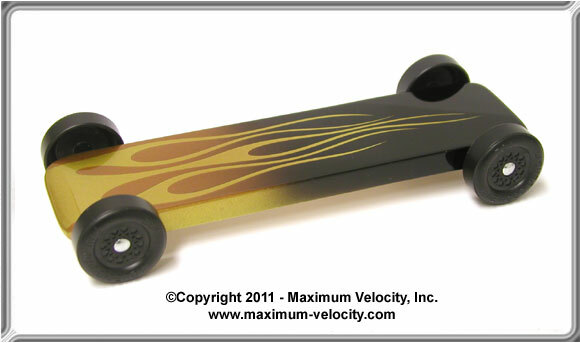 1/16" gold pinstriping was used to customize the car in the photo.